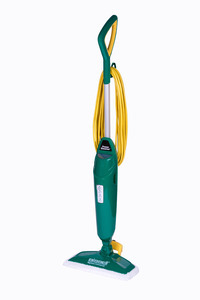 Sanitize floors with the BISSELL BIGGREEN COMMERCIAL PowerSteamer Steam Mop, which eliminates 99.9% of germs and bacteria when used as directed. Shine floors while you clean sticky, dried-on spots 2X faster than the leading steam mop with the built-in Easy Scrubber or scrubby microfiber mop pad. Remove tough spots with the built-in, flip-down Easy Scrubber. 3 Washable Microfiber Mop Pads, Two soft pads for everyday and one scrubby pad for heavy messes. Customize your clean with the SmartSet digital, variable steam control (low, medium, high).